In the last week we deployed new code to Flickr 50 times, including 546 changes by 16 people. We issued over 2,000 new API keys, and third party developers made an average of 704 API calls per second, across 109 public API methods. We added 1 new API method, and updated 7 others. There are approximately 10,000 lines of open source code in our public subversion repository. And our new developer site, code.flickr.com, is where you keep up with all that. We haven’t talked about it much, but our latest Uploadr (the 3.0 branch) is actually a cross platform, open source application built on the XULRunner framework (the same technology that Firefox is built on). If you’ve ever had a wish for the Uploadr to work a certain way, include some particular feature, or just work better, you’ll want to check out Richard’s meaty blog post “Flickr Uploadr, start to now”, checkout the code from SVN, join the Uploadr Group, and start hacking! We’ve also got a new blog written by the Flickr developer team for the larger Flickr development community. We’ll be covering changes to the API (look for a post covering video in the Flickr API soon), cool Flickr related projects we discover, writing tutorials on Flickr API methods, and most anything else which catches our whimsy. If you have something you like covered, you can let us know on in this thread in the Flickr API group. 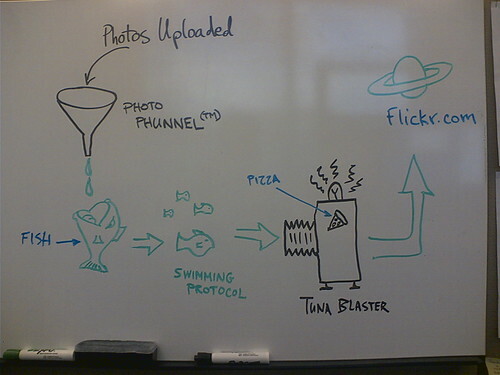 Photo: “How Flickr Works” by straup.